2019 will see the return of the two ROK Festivals. These one-off event weekends will not only have big prizes but a renewed effort to bring the word ‘FUN’ back into karting. 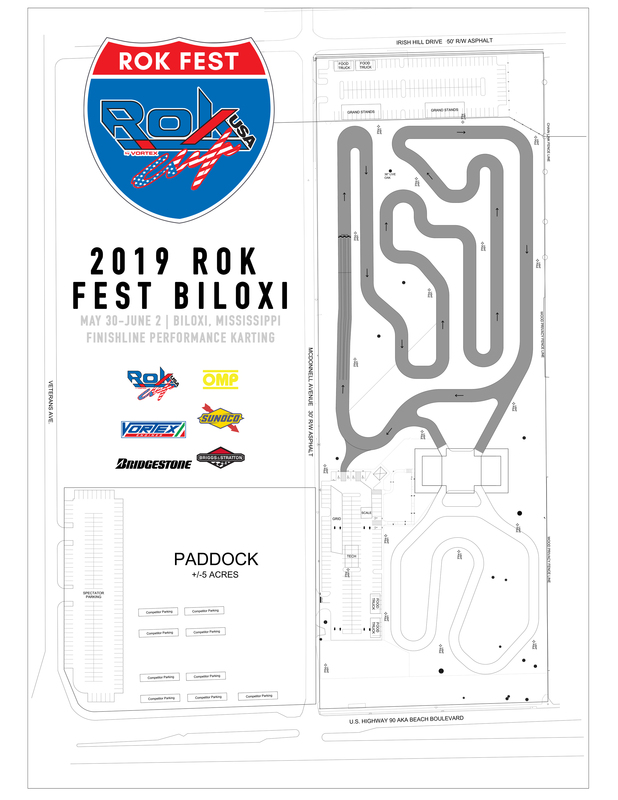 The first of the ROK Festivals will take place May 30-June 2 at the state-of-the-art Finishline Performance Karting, located on Biloxi, Mississippi’s beachfront. The second and final event of the ROK Festival program will have dates and venue to be announced soon. Each event will see a unique trophy theme. Biloxi class winners in Mini ROK, Junior ROK, Senior ROK, Masters ROK, Shifter ROK and Shifter Masters ROK will receive ROK CUP Superfinal tickets. The top three in Micro ROK, Junior 100cc and Senior 100cc, as well as the second and third place in Mini ROK, Junior ROK, Senior ROK, Masters ROK, Shifter ROK and Shifter Masters ROK will receive ROK the RIO tickets. Briggs class winners will receive ROK the RIO entry and use of a Vortex 100cc engine during the event. Please note that all teams will be required to use a tarp as their flooring base to protect the grass from any fuel or oil spills. South Beach Biloxi Hotel & Suites is the only hotel located directly on the beach. Close to popular Biloxi attractions and casinos, South Beach Biloxi Hotel & Suites is a unique luxury all-suite hotel. Expect the best in guest amenities, the best in scenic views, and personalized service. Elegantly designed suite accommodations await you. Want to catch an Gulf breeze or watch the sunrise? Step onto your own private terrace or gaze out the floor to ceiling windows of your suite. TO RESERVE: Please call the hotel directly at 228.388.2627 and mention the rate code BATTLE519 to receive rates listed below (only valid for May 27th-June 2nd, 2019), or book online at www.sbbiloxihotel.com. Step 1 choose dates, click book now, click add code, select rate access/corporate code and type in BATTLE519, then select the room type you would like. TO RESERVE: Guests can book by visiting www.margaritavilleresortbiloxi.com. Active dates are 5/27/19-6/3/19. By entering ROKFEST in promotion code for those dates under the book now tab, guests will receive 20% off.